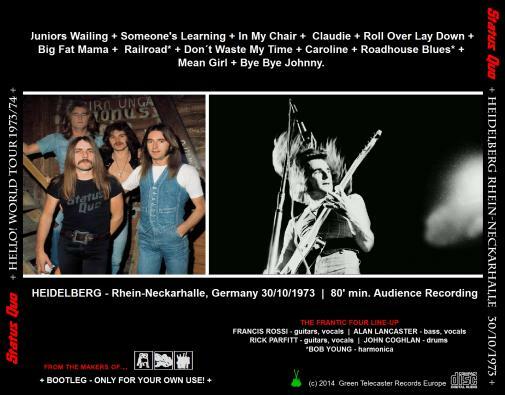 Main Setlist: Junior's Wailing, Someones Learning, In My Chair, Claudie, Roll over lay Down, Big Fat Mama, Railroad, Don't waste my time, Roadhouse Blues, Caroline, Mean Girl, Bye Bye Johnny. Support Bands: Savoy Brown* (UK dates), Sensational Alex Harvey Band** (Europe), Fleetwood Mac [bogus band] Nazareth and Badfinger (all in USA). Tour Notes: Their second US Tour failed after a couple of shows as the Fleetwood Mac in question were not the real band. So the audience walked out in disgust, demanding their money back. The show at Winnipeg Playhouse Theatre, Canada (21.2.1974) and afterwards the hole tour were cancelled (Francis and Rick got ill). 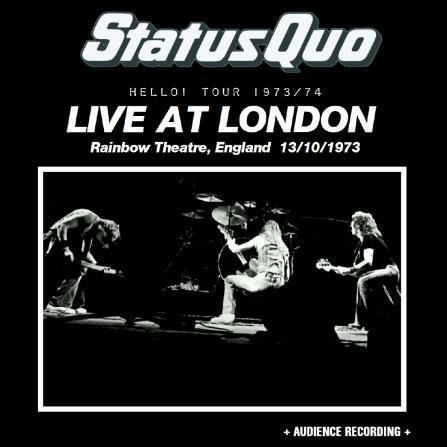 So Quo did a few shows with UK rockers Nazareth and Badfinger instead and a couple of gigs alone in US Colleges and tiny clubs. 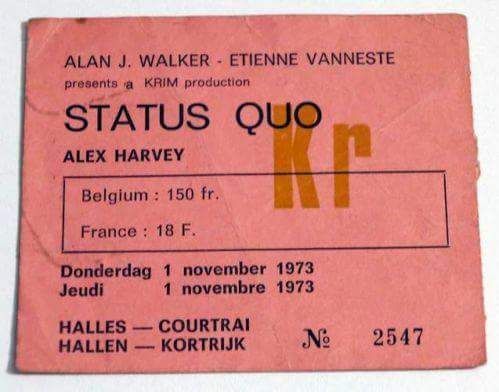 Also a full tour of Italy in November 1973 and some gigs in Switzerland, Germany and France 1974 were cancelled or changed. 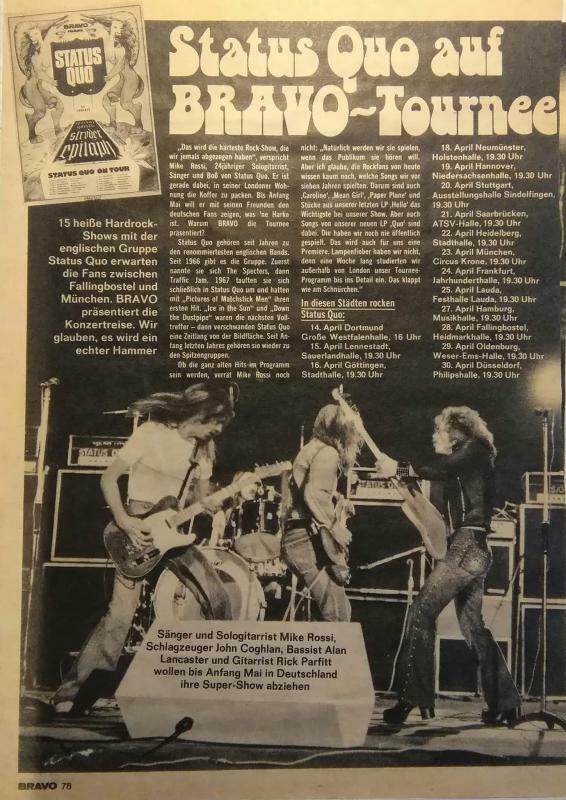 1.12.1973 - there was a US tour schedulded for December (dates from Billboard magazine) but cancelled by short hand: 1.12. Miami Jai-Alai Fronton, 2.12. Tampa Curtis Hixon Hall, 4.12. Alabama Florence State Uni, 6.12. Cleveland Case Western Reserve Uni, 8.12. Millersville State College, 9.12. New Jersey Trenton Civic Auditorium, 12.12. - 16.12. Los Angeles Whiskey A Go Go. Most of the US/CANADA dates from original schedule or Billboard magazine. 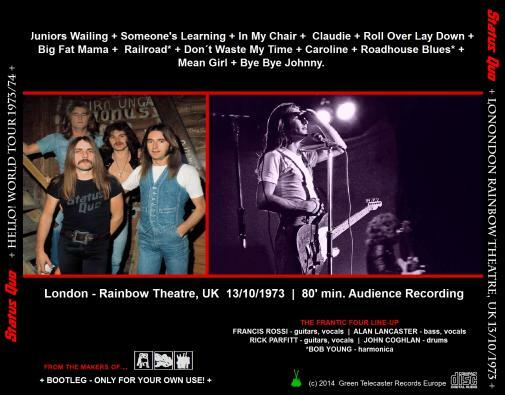 Some of the dates were re-scheduled due to the false "FLEETWOOD MAC" debacle althrough research is ongoing recarding what actual gigs were played with the "Bogus Mac". 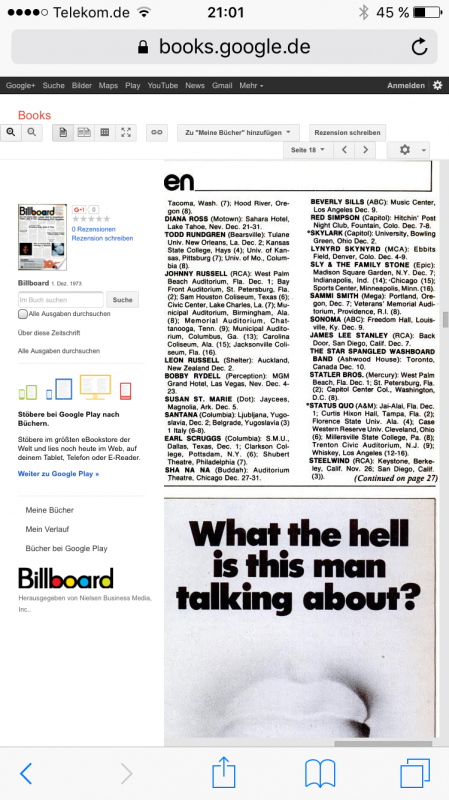 The following dates were also scheduled at Billboard magazines in 1974: 22.2. Fargo Civic Auditorium, 26.2. Wichita - Century II, 6.3. St. Louis Ambassador Theatre, 8.3. Delphi NY State University, 9.3. Burlington University of Vermont, 12.3. North Hampton Pa. Roxy Theatre, 13.3. Hamburg Pa. Fieldhouse, 15.3. Hollywood Fla. Sportatarium. Not more than 2 songs into the set at the Edmonton Kinsmen Fieldhouse 20.2.1974, the crowd started to boo and heckle the "Bogus Mac" band (later becoming Stretch with Jeff Rich on drums). Fans remember bottles being thrown on stage! 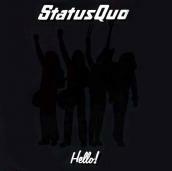 In addition to these problems, rumours said - both Francis Rossi and Rick Parfitt "took ill" and were having to soldier on as best they could. 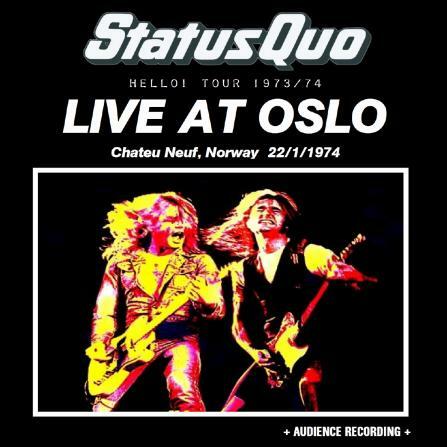 Given the circumstances, Quo had no option but to finally out of the US tour only after the first batch of dates (scheduled were six weeks from coast to coast) and returned earlier home to the UK. 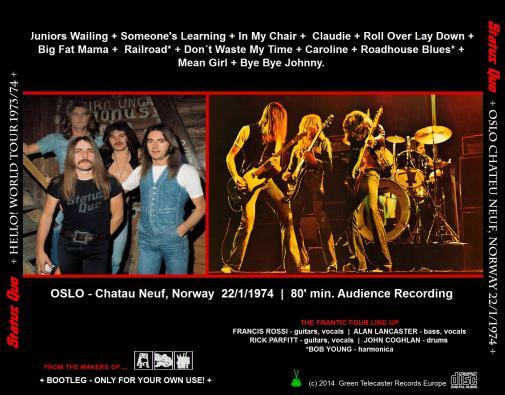 At least 5 shows were at the famous Whiskey A Go Go Club in LA with the band being heavily promoted by A&M Records America for the HELLO album. A&M publicity pics and info packs were available on these dates and two appeared on Ebay 08/2007. 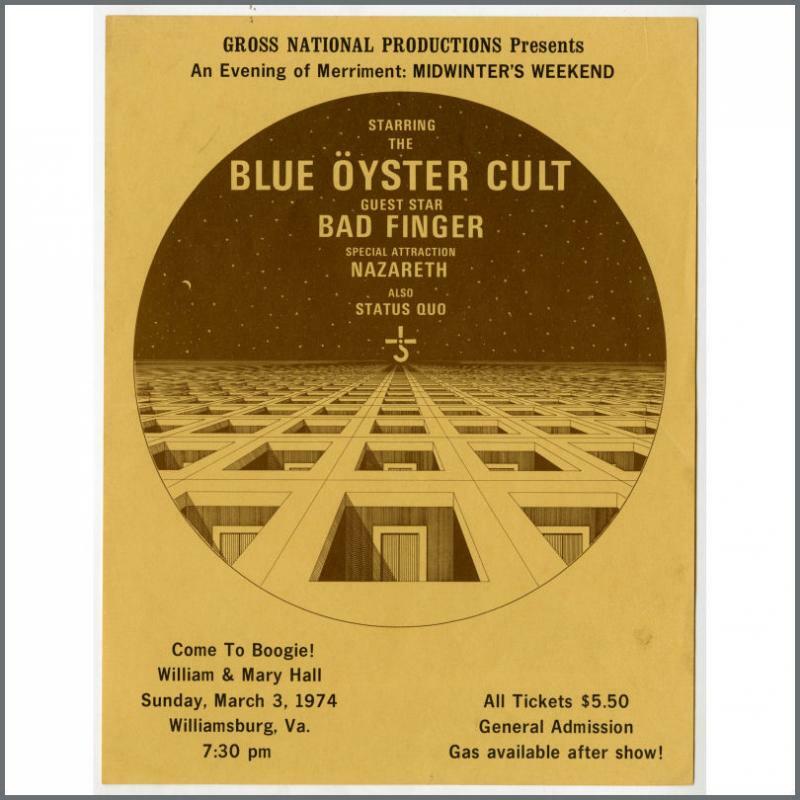 There appeared also a ticket on Ebay 2015 for the gig at Northampton Roxy Theatre, USA 12.3.1974. I'm not sure, the show wasn't cancelled by short hand. 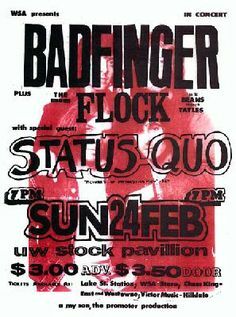 The gig was sponsored by AM radio Station WSAN (Tickets were only $ 2.00) - so the research is still going on...! 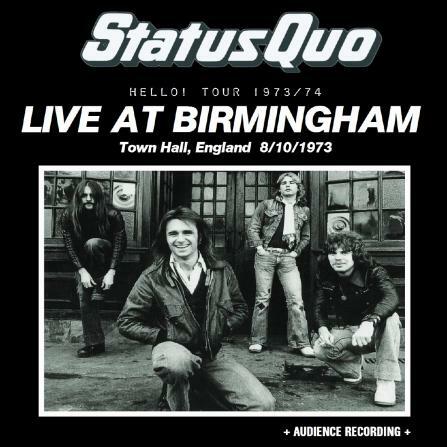 13.11.1973 - Allthough it had been reported that Quo's November/December 1973 USA Tour with Billy Preston had been cancelled. November dates were advertised at Billboard magazine. 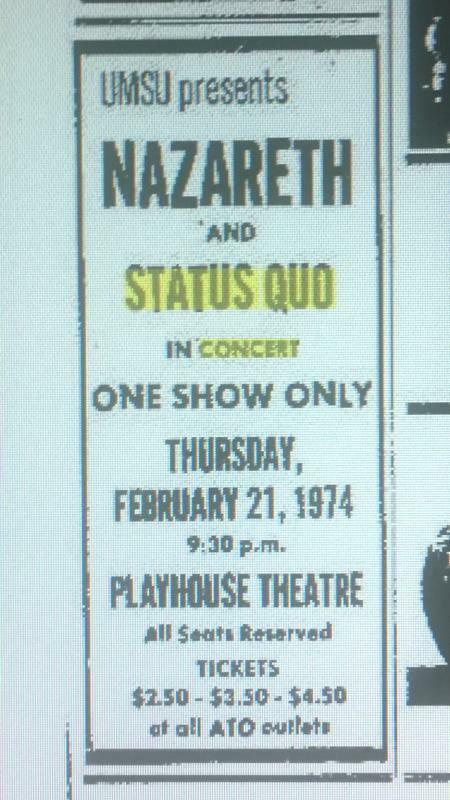 18.2.1974 - Nazareth was supposed to open the gig at Vancouver P.N.E. Gardens, but the crowd was told they had problems at the border, so Tim Buckley was drafted at the last minute. Thanks to Paul Cummings for the info. 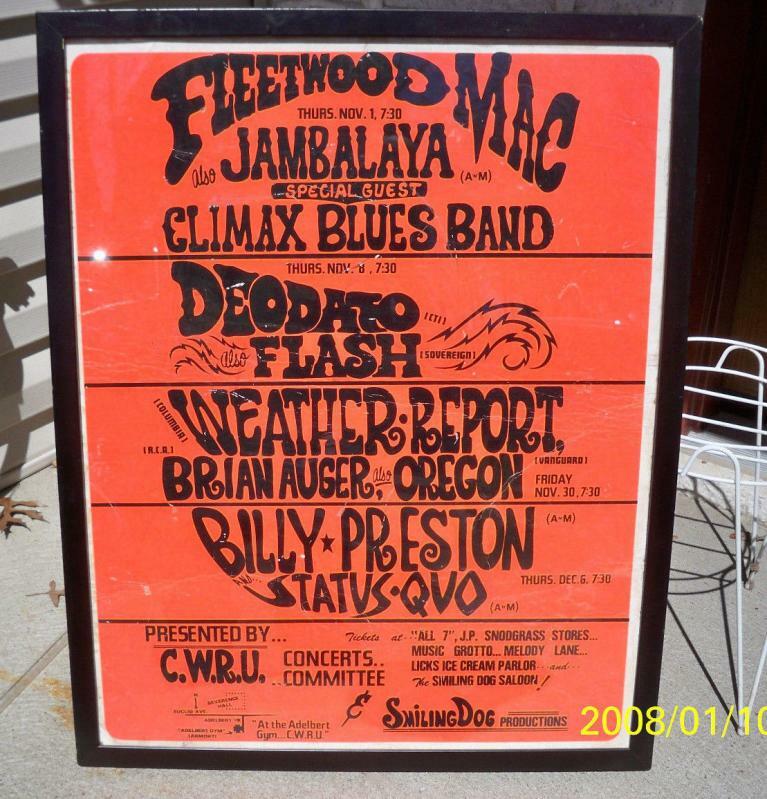 19.2.1974 - Fleetwood Mac's manager Clifford Davis had the rights to the name 'Fleetwood Mac' and didn't want to let a little thing like having no original band members in the lineup prevent Fleetwood Mac from touring. As a result, he recruited members of a band called Legs (with whom he'd released one single) and got them touring in 1974 as Fleetwood Mac. So that's a fake Fleetwood Mac touring under the banner of the real Fleetwood Mac. Genius.Fans were told that Welch and John McVie had left the band whilst Christine McVie and Mick Fleetwood would join along at a later date. For what it's worth, even Legs thought that Mick would be turning up at some point. So off they went... But they didn't really get very far as the band's regular road manager John Courage realised that the line up was a complete lie. 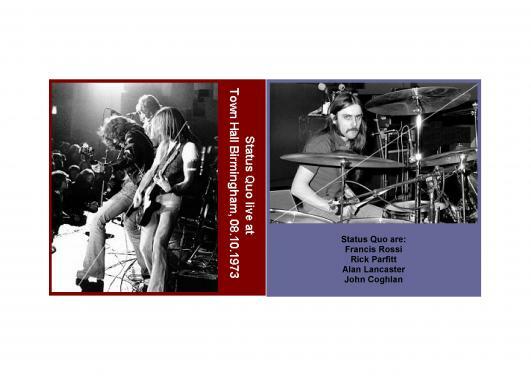 Rather than go to the press, he decided he'd do the best thing he could and hid Fleetwood Mac's equipment so it couldn't be used, thus shortening the tour considerably. 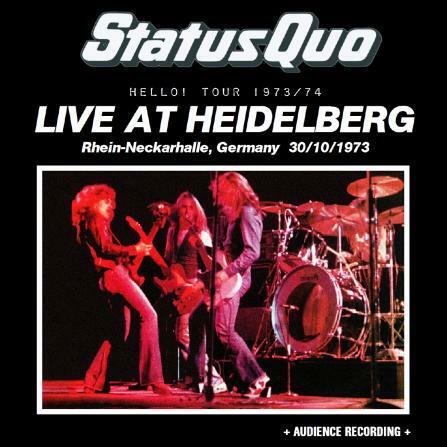 31.3.1974 - The Winterthur gig at the Eulach Halle was postponed to May 1st 1974 because the band had another TV appearance to do.